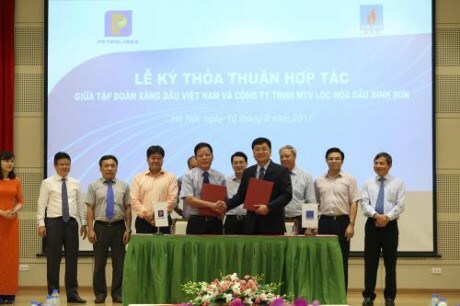 Hanoi (VNA) – The Vietnam National Petroleum Group (Petrolimex) signed an agreement with the Binh Son Refinery and Petrochemical Co Ltd (BSR) on August 10 on cooperation in boosting sales of petrol products produced by Dung Quat Refinery. In the deal, Petrolimex and BSR noted their wish to become each other’s strategic shareholders through Petrolimex’s purchase of BSR shares after BSR conducts equitisation and completes the Initial Public Offering (IPO). Petrolimex will give top priority to the sales of petrol, LPG and other petrochemical products made by Dung Quat refinery, which is operated by BSR. The two sides will collaborate to export Dung Quat’s products to Laos and Cambodia. They will also consider possibilities of cooperation in the fields of insurance and transport. Addressing the signing ceremony, BSR Director General Tran Ngoc Nguyen said the company aims to make the IPO at the end of this year. During more than 7 years in operation, BSR has produced and sold more than 47.2 million tonnes of products, meeting 40 percent of the domestic petrol demand. The company grossed total revenues of over 36 billion USD and paid over 7 billion USD to the State coffer, more than double the investment in the refinery.